When I started working with Shawn and Hannah on their dream honeymoon, I knew it was going to be fun. Like, really, really fun. They are some of the most enjoyable people to be around, partly because they are constantly making each other laugh and are always up for a new adventure. Their enthusiasm for life is contagious. I also knew that the year leading up their wedding had been filled with some amazing life events, and that they’d be ready for—and so deserving of—some serious rest and relaxation after their wedding, with nothing on their schedules but time for each other. The challenge was finding a destination that combined all these elements. Thankfully, St. Lucia left them smitten. 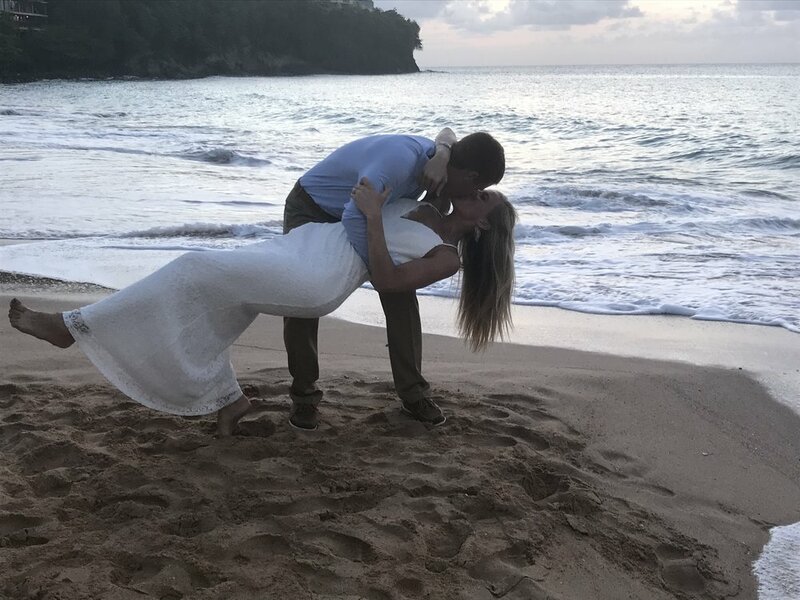 In their own words, here’s what Shawn and Hannah had to say about their honeymoon at Sandals Regency La Toc on this idyllic island in the Caribbean. Why did you pick St. Lucia for your honeymoon? We chose St. Lucia for our honeymoon, because we wanted to visit a place that was unique and that we’d always remember and look back on! As soon as Amy showed us St. Lucia, we fell in love with what we saw from the pictures. The island seemed so surreal, with the breathtaking Pitons bordering the Caribbean (which Hannah had never been to!). We loved the idea of honeymooning in an island paradise! What memories will you most cherish from your honeymoon? We were both so excited to honeymoon after our wedding and just spend time together. We debated if we should wait or go right away, and I am so thankful we were able to escape reality as a brand new Mr. and Mrs. and carry all the excitement and magic from our wedding weekend into the following week on our honeymoon. Life has kept both of us very busy over the past year, and spending quality time together was what we cherished the most. We loved everything about the experience, though, and we even met friends our very first night at the resort—which made for a fun week! We loved hearing about their weddings and lives back at home, and we soon found out that we all had a lot in common (four of the six women were teachers!). We also LOVED our excursions we did over the week! We snorkeled four times in the Caribbean and saw lion fish, eel and Dory’s. On one excursion, we even saw two humpback whales! So cool! We enjoyed a beautiful day sightseeing the coast of St. Lucia on a catamaran cruise, which included stops on land to many natural waterfalls, the sulfur springs from the volcano, mud bath, tour of a local coco plantation, and an authentic St. Lucian meal! The one excursion that was a dream come true for me (Hannah) was horseback riding! It was unbelievable and something I have wanted to do since I was a little girl!! We rode the horses two and half hours through local villages, up and down the hills of the northern shore, and, lastly, on the beach and in the ocean!!! I loved it!!! Would you recommend St. Lucia to others who desire an island honeymoon? YES! We loved St. Lucia! It was exactly what we were looking for! We were able to relax, but also explore the many activities that St. Lucia has to offer. We chose to do the all-inclusive route, which was wonderful! We never had to carry money while on the resort, which made for a stress-free week! The restaurants on the Sandal’s resort were phenomenal and ALL staff were beyond extraordinary! What advice do you have for other couples planning their honeymoon? 1. If you can make it happen, go right away! Life happens and you might not get that time back! We are so grateful that we were able to leave right after our wedding. The excitement of being married is alive and it truly carries over into your honeymoon experience! 2. All-inclusive! After budgeting and number crunching for the wedding, we were very happy to have a week where we didn’t have to worry about where to eat or what to drink. We could eat as much as we wanted or as little as we wanted, but it made the week that much more enjoyable knowing we had already paid for the honeymoon. We highly recommend Sandals! Although, we both LOVE kiddos, it was very relaxing going to the pool, beach and restaurants with adults. 3. Choose one night to celebrate your marriage! Although the whole week you will be celebrating your marriage, we chose one night to dress up “fancy.” We took pictures on the beach, and indulged in a very nice dinner! Why did you decide to use a travel professional for your honeymoon? We decided to use a travel profession to plan our honeymoon, because leaving the country can often be intimidating for those who don’t do it often. We wanted to have a professional opinion on islands in the Caribbean. Your honeymoon is one trip in your life that you especially want to make sure you get right, so having guidance in planning it will alleviate some of that stress! What did you enjoy (or not enjoy) about working with Amy on your honeymoon? We absolutely enjoyed working with Amy when planning our honeymoon! We appreciated that she listened to what we were looking for, researched and then provided us with options to explore that best fit within our needs and budget. She was there every step of the planning process, answered all of our questions, and made sure that all of our travel plans were complete. We would highly recommend Amy to anyone planning a honeymoon and will definitely work with her for upcoming trips. STILL LOOKING FOR YOUR PERFECT HONEYMOON DESTINATION? No sweat. I've got 15 questions prepped that every couple should ask before they start planning the most important vacay of their life.